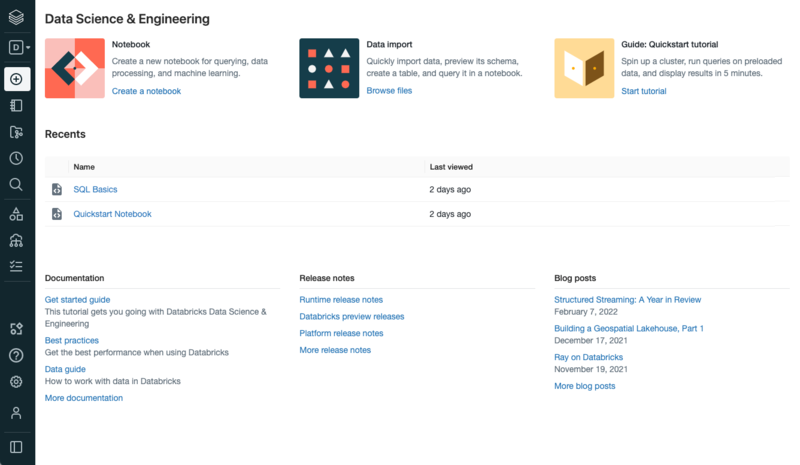 To help you get to know Databricks, you can try it out for free. You can choose between Databricks Platform Free Trial and Community Edition subscriptions. Both options give you free Databricks units (DBUs), units of Apache Spark processing capability per hour based on VM instance type. Databricks Platform Free Trial is more flexible, but Databricks uses compute and S3 storage resources in your AWS account. During the sign-up process you grant Databricks privileges to access your AWS account and an S3 bucket. When you register for the trial, you can request credit for free AWS resources. When your free trial ends you receive an email informing you that you are automatically enrolled in the Databricks Standard Plan and can add optional features. Databricks Community Edition is fully resourced; you are not required to supply any compute or storage resources. However, several features available in the Databricks Platform Free Trial, such as the REST API, are not available in Databricks Community Edition. For details, see Databricks Community Edition FAQ. You can cancel either subscription at any time in the Account Console. This topic describes how to sign up for a subscription. Go to Databricks and click the button at the top right. Click GET STARTED - FREE to choose Databricks Platform Free Trial or GET STARTED to choose Community Edition. When you select Databricks Platform Free Trial you’ll see this registration form. To get free AWS credits, click learn more. Fill out the PoC credit application and click Submit. Wait until you are contacted by Databricks before you continue with the trial registration process. When you receive the Welcome to Databricks email, click the link to verify your mail address. The Account Owner Login page opens with your credentials filled in. Fill in your Billing Details and click Next Step. Follow the steps in AWS Account to configure your AWS account information. Follow the steps in AWS Storage to configure your AWS storage information. 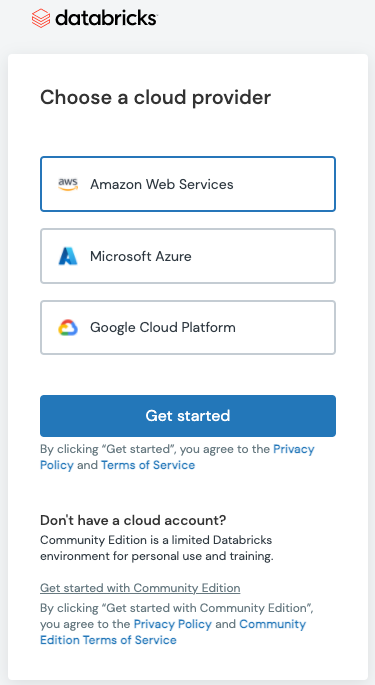 Agree to the Terms of Service and click Deploy. The deployment link displays. Click the deployment link to log into Databricks. Log into Databricks using the credentials you supplied when you registered. You’ll see the Databricks home page. When you select Community Edition you’ll see a registration form. Read the Terms of Service and click Agree. When you receive the Welcome to Databricks email, click the link to verify your mail address. Log into Databricks using the credentials you supplied when you registered. 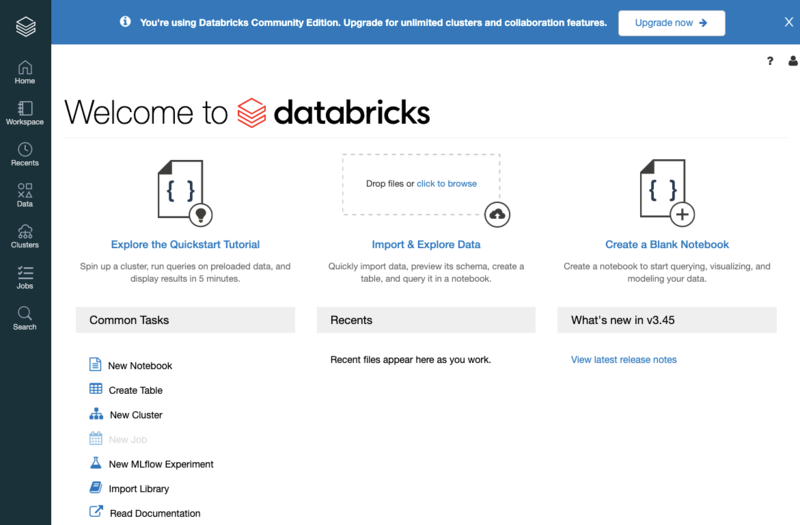 You’ll see the Databricks Community Edition home page. Log into your account using the username and password that you used when you created the account. Operational Security: In the box labeled ADD-ON: DATABRICKS ENTERPRISE SECURITY, click the link. Enterprise Plan: In the box labeled Enterprise Plan, click the button. Dismiss the dialog. An account representative will contact you.